Trip price € 275.- per person in a double room. € 48.- single room supplement. Three nights, bed and breakfast, 3 Star hotel in Sölden, round trip bus from Heidelberg, and a great group of people to accompany you. Skiing above 3000 meters with excellent snow conditions allows you to get an early start on the ski season, and enjoy the fun and sun to the utmost. Why wait any longer? Here is film from the early November 2015 trip-to Hintertux. OBERGURGL from 22.-25 November, 2018: Get a headstart on nature and join our November trip to Obergurgl. Here, you will be skiing the full mountain - no glaciers to conquer. And, you will have walk-out-the-door skiing as well. The slopes are a snowball's toss away, and soar to over 3000m. A 3 star hotel with five star facilities offered for a price that you just can't beat. For value, this is the best. Dates are from 22 to 25 November. Featuring 3 nights, 3 x half board, a fantastic sauna and wellness facility, gourmet meals, ski in, ski out convenience. Why wait till winter? All this for € 330.- per person in a double. € 66.- single room supplement. All inclusive package from 12.-16 December. Trip price € 650.- per person in a double room. 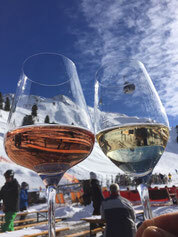 Switzerland on the cheap, with no hidden costs and all drinks included as well: 4 star Club Med Roi Soleil Resort, 4 nights, full board, 4 day ski pass, 3 days of lessons, open bar, all drinks at meals, wellness with pool and sauna, walk to the lifts. Skiing three mountains over 3,000 meters in elevation. Do the math-a deal you won’t be able to match anywhere in Switzerland. For the top skiers, you get a local guide as an instructor and will be escorted to powder filled bowls and untouched slopes!! Check out some of the places we skied in 2018! Trip price € 525.- per person in a double room. Walk to the lifts or take the hotel shuttle. Spoil yourself with that great Italian cuisine. Explore the majestic mountains with the Super Ski Dolomites Ski Pass. 5 night package with half board, royal New Years Eve feast, 3 star hotel with wellness. Kitzbühel, Austria, from 18.-20 January, 2019. Trip price € 228.- per person in a double room. Whether you dare to test the Hahnenkamm or prefer to cruise above Pass Thurn, the Kitzbühel region has the entire alpine experience. We stay a 10 minute ride to the lifts in Stuhlfelden, in a hotel with wellness and charm. 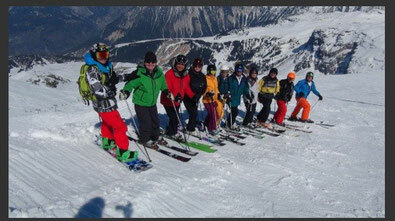 Round trip bus from Würzburg, 2 nights, half board, ski guide. Schruns and the Montafon from 15.-18. Feb., 2019. Trip price € 315.- per person in a double room. € 57.- single supplement. Experience the mega-resort Silvretta Nova, with highlights such as the Black Scorpion with an incline of over 80%, oder Nachtrodeln, oder a ski safari nach Valisera und zurück. The package offers round trip bus from Würzburg, 3 hotel nights, and half board. Another GREAT location with a hotel only 8 km. from the lifts with wellness as well. Val Thorens and the 3 Valleys, France from 29 March to 8 April, 2019. Trip price with bus in apartments from € 455 to 595.- per person depending on number of people and size of the unit. 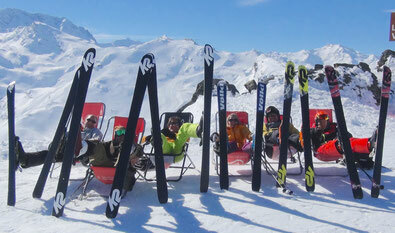 And, if you book before 30 December, you get the 3 Valleys Ski pass for the children's rate!! With longer days (thanks to the time change), join us for our flagship tour. People fly in from London, Brussels, and from the States to participate in our annual pilgrimage to the best skiing in the Alps. Like Canada-but without the jet lag. With over 500km. of marked runs, you can ski almost forever. And, bring your avalanche gear, as we try to avoid as many marked runs as possible-the off piste is that good. Come join us one day for a water ski pond crossing adventure on the back side where you can ski alone for hours on end. This is the one ticket you have to punch. The only negative is that you have to wait until the end of the season to do it. 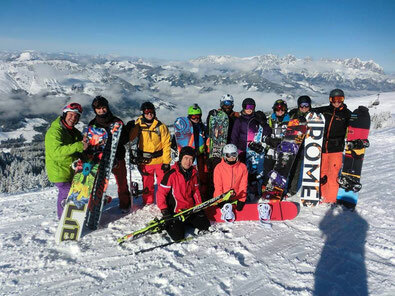 Package includes round trip bus from central Germany, 7 on-slope apartment nights, ski guiding and videos. Don’t believe all this: Check out the deep stuff we found in 2017 in our "Don't Stop Believing" Ski Extravaganza. And "More Than A Feeling" from 2018. Ischgl Ski Finish from 28 April until 1 May, 2019. Trip price with round trip bus from central Germany, 3 hotel overnights, 3 star hotel with sauna, Bed and breakfast. €325.- per person in a double.